Karma is a difficult thing to explain to people. I have tried, and tried. I think this article will be good in bringing it all together, and putting clarity out there on the subject. Karma is energy. Good and Negative. What you put out into the Universe, is what you get back. No escaping, and there are no chances of it not ever reaching you. It is the cycle of energy. Everyone views this reality, sharing in the same thoughts of the collective. What is cycled in the collective, will affect each of us. Since all is consciousness, the karma is in the consciousness. Your soul is a sphere of light, and when it reaches the physical world and body, it anchors down into the brain, to drive the vehicle (the body), so to speak. In doing so, any thoughts that you put into the consciousness, will automatically program into it. Those thoughts also cycle in and out of the atmosphere, sharing consciousness with everyone around you. This goes into the akasha. But what is more is, karma embeds into the consciousness, the soul. The negative spots in the consciousness, that were placed there by your own thoughts, and feelings, as well as subliminal energy that is sent to you. This can be through traumatic experiences, and eye witness accounts of seeing traumatic things that have happened to others. There are so many things that can create good or bad karma.. However, if negative karma is obtained, it will sit in the place of memories as trauma, negative thinking, or subconscious ideas, that the person may not be aware of, or maybe in denial about. It is hard to cleanse all of it, out in one shot. This is because of the many layers that it hides in. 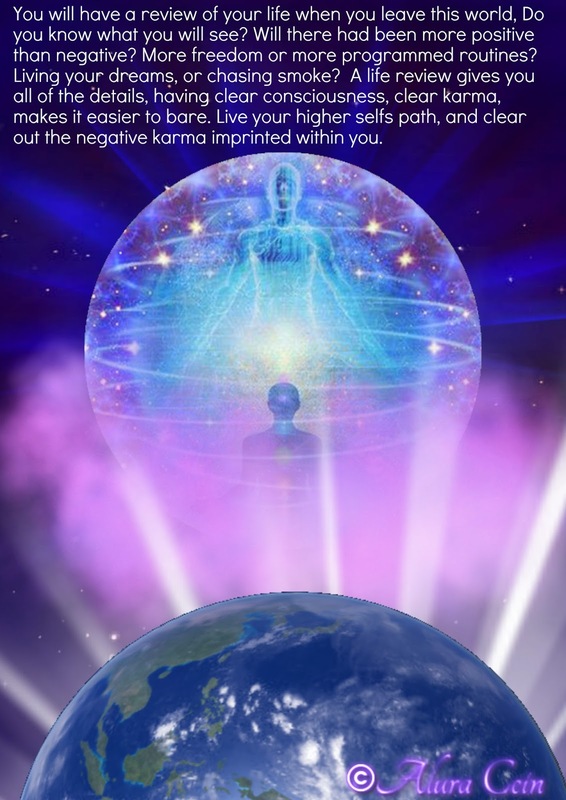 The negative karma creates little dark blemishes in the etherical records in all planes, your consciousness, the consciousness of the realm committed in, and the consciousness of the Universe. As well as, the consciousness of those sharing this karma with you. Those who would be sharing in the karma with you would be the victims inflicted by deeds, thoughts, or emotions, and the one inflicting it. Once it is cleansed out, the person will feel so much better, like they can start new. There is karma going around everywhere, all of the time. It will be recreated at some point, through new things done, said, thought, or felt. People draw karma back to themselves, through not being able to forgive themselves. They may have it all cleared, but not release the guilt, or the shame that was attached.. In that case, it forms a copy of the original karma, and now there is double to clear, and even harder to remove, if they can not let go. The soul may not let go, but the Surface you may say that you have. You are not aware of what your soul says or wants all of the time, especially on the higher self level, until fully awakened and deprogrammed from this world’s program. The unconscious, and subconscious, also hold vital information, that without your knowledge of on the surface, may stay hidden and buried. Another thing, is that the other people whom the karma was involved, may not forgive, or move on. Subconsciously, or on the surface. either, or. No one truly understands the heavens, or this all would have been known already. The in’s and outs of the spiritual worlds of consciousness. However, many say, “Alura thinks she knows everything, I do not like her, what she says is not what the New Age says, or what the other teachers say”. I know… Whatever others may say or think about me, I never presume to know everything, but I do know alot… There are many levels of consciousness, those awake, should already know all of this then.. no offense to them, but its true. To prevent new karma, watch what you say. Your thoughts, and words are powerful. I knew a girl who learned this the hard way. She said “Oh look at that girl, she is disgusting , missing teeth and ugly”. She was a girl I grew up with who was speaking of a poor girl whose parents had no insurance for the dentist. Later on, her words came back on her. now she is missing all of her teeth herself. I did not even realize it was connected to what she said. Then some time later too, in the meantime, she had put down another girl in her own family. The girl was on drugs pretty badly, and had turned to prostitution. She said about her “Nasty, she is so nasty, she doesn’t deserve anything good to come her way, I would never be like that”. But sure enough, one of the reasons why she lost her own teeth, was because like the girl she put down, she too ended up on drugs, and prostituting that her teeth rotted like the first girl she criticized..
What’s more, she even after all of that, wished for a girl she hated, to have her life fall to pieces Seemingly, the girl she wished harm too, did have her life fall apart. But not long after, her own did too. That is when she came to me on her knees begging for mercy. She could not understand why all of this had happened to her. Then I told her, “Everything you ever said or thought about someone else, has come back on you.” That made her think and it dawned on her.. Karma was very real. This is a true story. And not the only one I have, but you get the point. Guard your thoughts, send love, send hope. “Love your neighbor as yourself, Angel Emmanuel said when he incarnated as Yeshua (Jesus). “Do unto others as you would have then do unto you.” Yep, that is the golden rule. It is another key to preventing karma. If you do not help, then you will not be helped by another when you need it. You can not help and expect the same person that you helped to help you later.. Karma does work like that. So get rid of thinking like that “I helped them and they never help me:”. It is negative. Instead help or give openly, and some one better off than you, when you are in trouble, will be there for you when you need it, as you were there for the person in a worse spot than you at the time. How you expect someone that you once helped, to return the favor? Obviously, if they could help others at all, they could have helped themselves. Still give, and the help will come back in other ways. Do not help, and it won’t. You will get the karma, of someone you ask, telling you no, like you did to the other person who came to you. Have a level of awareness at all times. If you follow those simple rules, you will not obtain karma. But in truth, if you are a being of light and love, you wouldn’t need me to tell you all of that anyhow. But just in case.. Be careful too, in who you trust to clear your karma. Not all psychics are angels, and they see your inner most sins, while clearing karma, so they could judge or better yet see your vulnerabilities. Be careful whom you trust your soul to. Karma is something negatively obtained while in this environment, to imprison you here. It still does not change that the archons keep track of it. As they do with every soul who enters this plane. They feel once a soul comes here, that they now belong to them. But, even though the Universe has only currents of negative and positive to keep the balance and not so much of deed, what you do negatively here can still hurt it through the network of light. So be careful not to hurt the Universe, in your karma too. Positive Karma is working all of the laws of the earth, each spiritual beings, and the Universe. This means, that after following all of the tips I gave to you above, that you have respected each being, and saw things from their level to relate, and show compassion. At that point, you know what true unconditional love is all about. That creates good Karma. You can not do good things just for the sake of appearance, or for the sole purpose of making good Karma. Then you are doing those things with conditions. It is like people who donate to charity. They say “Oh boy, now everyone can see that I am a good person, and I will have many blessings.” While that is true, the person is still doing those things with condition, the opposite of unconditional. And if things are done with condition, then it suggests insincerity. That will not bring good Karma. Instead, it will draw to that person others, and situations that are not unconditional. And that is negative. Do all things with true unconditional love, and for the sole purpose of being good without Scythian in return, and you will receive golden karma instead.. that golden karma, does bring it with it a reward far greater than anything here on Earth.